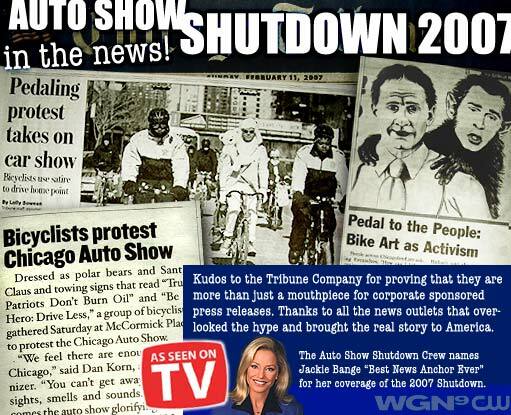 Join cycling friends this Sunday Feb 20th 2011 for a whimsical bike activism outing to "shutdown" the Chicago autoshow. 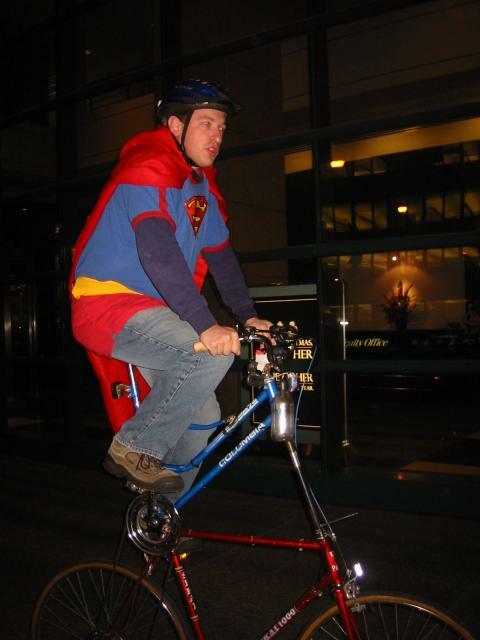 Starts in Daley Plaza (50 W Washington, under the Picasso) after noon, then a short social ride reaching McCormick Place (2301 S King Dr) by 1pm. 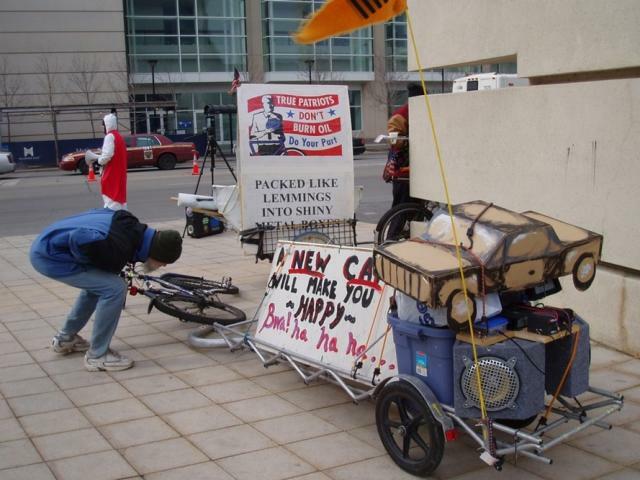 There we'll spread joy and inspiration about low-car living with costumes, cheers, conversations, free advice and demos. We'll be flyering for the next Saturday's Cycle Swap in Pulaski Park, where consumers can "tradeup" from their cars to bikes. Promises photos and fun, and warm drinx somewhere after 3pm. 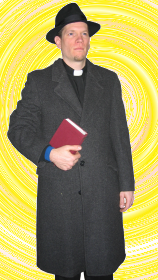 Latecomers text ? to u@massup.us for updates. 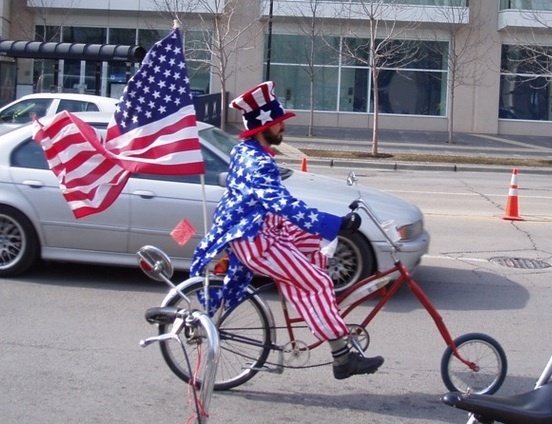 "Honk If You Love Bikes!" Revenge of the Crash Test Dummies! 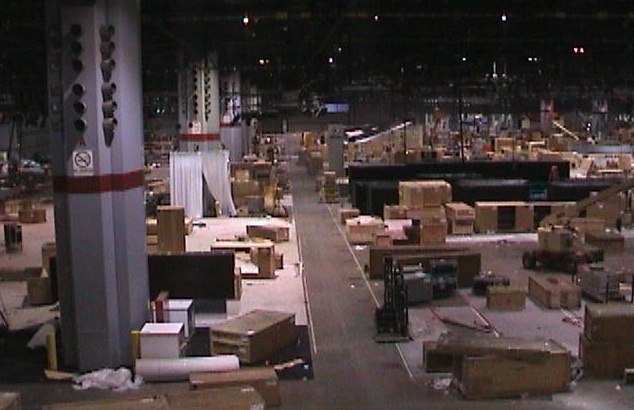 The Ninth Annual Chicago Auto Show SHUTDOWN was a fabulous success. On a beautiful, sunny day, thousands of would-be auto show patrons were treated to a spectacle far superior to the tired old rooms of cars inside McCormick Place. We had crash test dummies, music, superheroes, banners, speeches, a parade, and even groggers! Several members of local law enforcement shed their cars and rode bicycles with us in solidarity. 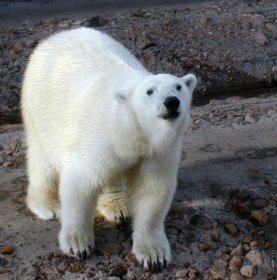 Dozens of children went home with stuffed polar critters, becoming the vanguards of next generation of appropriate transportation and development advocates. Many minds were freed from the AutoMatrix. Great fun was had by all! In the end, facing a tidal wave of overwhelming public opinion, the Auto Show had no choice but to close. Without the much-needed transfusion of capital from their trade show, car companies were forced to implement their "doomsday" plan and severely reduce the number of highways available for automobile usage in the Chicago area. Among the closures, Lake Shore Drive will be depaved, and the lakefront will be returned to the people of Chicago. Automobile industry representatives were seen fleeing, tailpipes between their legs, back to their secret bunkers. Fortunately, they are all currently stuck in a massive traffic jam on the highway back to Detroit. (Of course, each of them claims that the traffic jam is the fault of all the other automobile executives on the road.) Rumor has it that they are hunkering down, planning future advertising campaigns in a desperate bid to salvage the relevancy of their obsolete machines. Rest assured that we will monitor their nefarious activities and be prepared to meet them in the event that they emerge from their steel cages and again attempt to threaten humanity, and our fair City. The only down side to shutting down the Auto Show is that it can take up to a whole year for the automobile industry to get the nerve to try to put on their show again, if they even dare. So, we have to wait a while for the next SHUTDOWN Festival. However, even though the Auto Show has been shut down, there are still plenty of opportunities to help counter the constant barrage of propaganda by the auto industry. If you missed the SHUTDOWN, or you just want to do more, check out some ways to get involved year-round. Check back soon for more reports from the SHUTDOWN, including pictures and video! VIDEO: Lost & Found: Polar Revolutionaries Unite! Snowball the Bear led dozens of Chicago cyclists and others in the 8th Annual Chicago Auto Show SHUTDOWN Festival on Saturday, February 10, 2007. Read some of the media reports. Look at our latest pictures and video!